The Bellaire City Council recognized students in Praveen Kumar’s applied finance projects course in May for developing an analytical budget tool for the city. For graduate students in Professor Praveen Kumar’s applied finance projects course, learning goes beyond the classroom — it extends into lasting real-world scenarios, with the class last spring developing an analysis platform for the City of Bellaire’s budget that will be used for the next several decades. 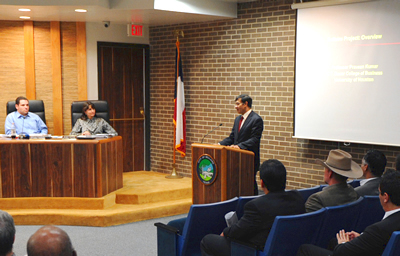 What started as a conversation between Kumar and Bellaire Mayor Cindy Siegel became a project developed by the students to give the city a practical and usable framework to project its financial position in the medium and long run and to allow the city managers and its elected representatives to examine effects of various policy changes. “The platform is quite versatile in allowing scenario analysis, either by changing a few global parameters, such as the growth rate of property valuations or the inflation rate, or by manually inserting data as it becomes available in real time. The project not only developed the platform, but the students worked very hard to input all the most recent data so that Bellaire officials can start using the platform in a focused manner immediately,” he added. Kumar gave an overview of the project during the council meeting, highlighting the depth the students went to, considering all factors that contribute to a city’s financial position. In order to effectively develop such a complex project, the students had to become knowledgeable in every aspect of a city’s financial position. They had to consider factors from property values and municipal bond financing to the details and prospects regarding pension and medical insurance costs and the regulations concerning the designation of residential versus commercial properties — essentially anything and everything required in order to properly and effectively budget an entire city. “The analysis will be used by the city managers and elected officials to plan for likely financial problems and help them do important scenario analysis with respect to changing policies or with respect to the changing economic environment,” Kumar said. City officials have lauded the work of the students, presenting Kumar and his class a formal appreciation proclamation by the Bellaire City Council in May for their work.